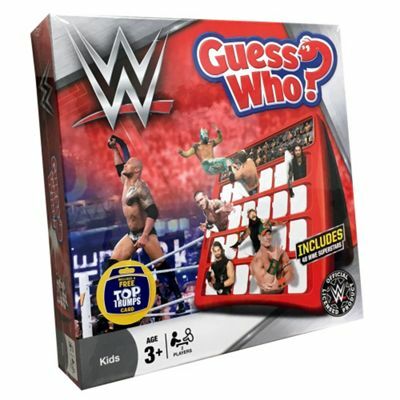 48 of your favourite characters in this classic face guessing-game including the Rock, John Cena and Seth Rollins. Ask the right yes or no questions to close as many doors as possible and uncover your opponent's mystery character. Add the ultimate twist in the championship game by choosing two characters each. Fun for all the family with a plastic game frame so it's easy-to-play and set-up. Is your mystery character wearing glasses? does your mystery character have a beard? is it John Cena? Contents: 2 trays, scoring sliders, double sided character sheets.